The Ranch at Rock Creek is a luxury guest ranch that brings together upscale amenities and wide open spaces like never before. 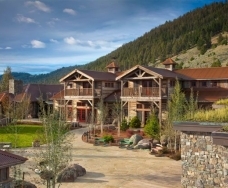 Set among 10 square miles of rugged Montana ranchland just outside Philipsburg, guests experience limitless outdoor recreational opportunities, outstanding accommodations and cuisine, and a full-service spa. Families, couples and friends will discover that The Ranch at Rock Creek is a place that offers the feel of the 'true West' without sacrificing true comfort.